Again, two different mains..but the beans unite us! As usual, Bob and I never eat the same meal. That is actually a pork chop on his plate. Not a great picture, but I can only look at that for a couple of shots! I of course, had the shrimp. Big surprise. (That I bought) The beans that we shared were so good. I made them with fresh ginger, scallions, roasted peppers from a jar and one jalapeno pepper that I am still tasting! Sauteed everything together in a skillet with some oil. The beans from Birdsong Farm were so fresh, I think I cooked them for 4 minutes. I am down to shelling peas and kale. We all know salad is a givin!! This entry was posted in Dinner on July 21, 2011 by andrewsbeth. You’re so amazing to cook such persolaized meals each night. They both look so beautiful. The beans look great. I’m so excited to know we’ll be getting fresh beans every week for the foreseeable future! That shrimp looks outstanding and I would so order that in a restaurant!!!! Why the heck didn’t Bob just have shrimp too? He loves shrimp! Would you teach me how to make it? 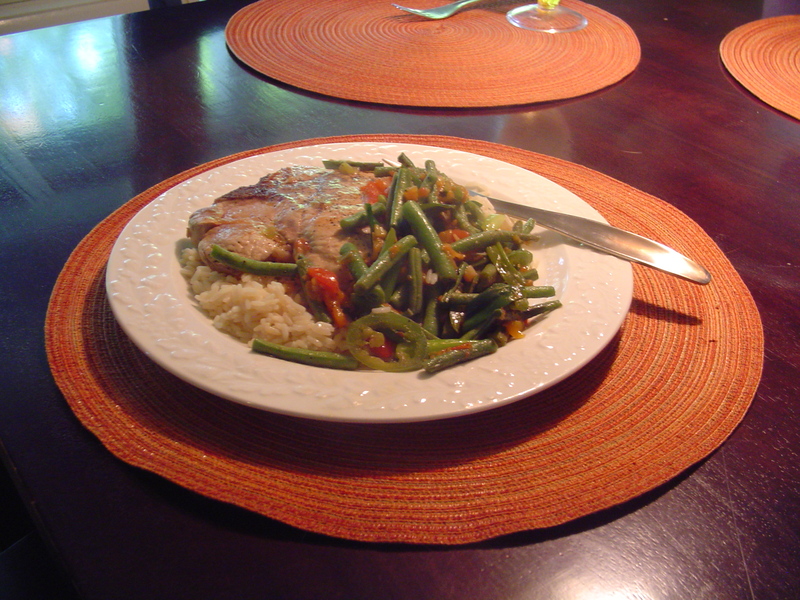 We had the green beans last night too, and they were sweet as candy! I only cooked them for 4 minutes also and then put butter, and a little salt and pepper. So yummy! I usually do make two meals most nights with some common sides.But, I can’t take credit for this shrimp. I bought it. 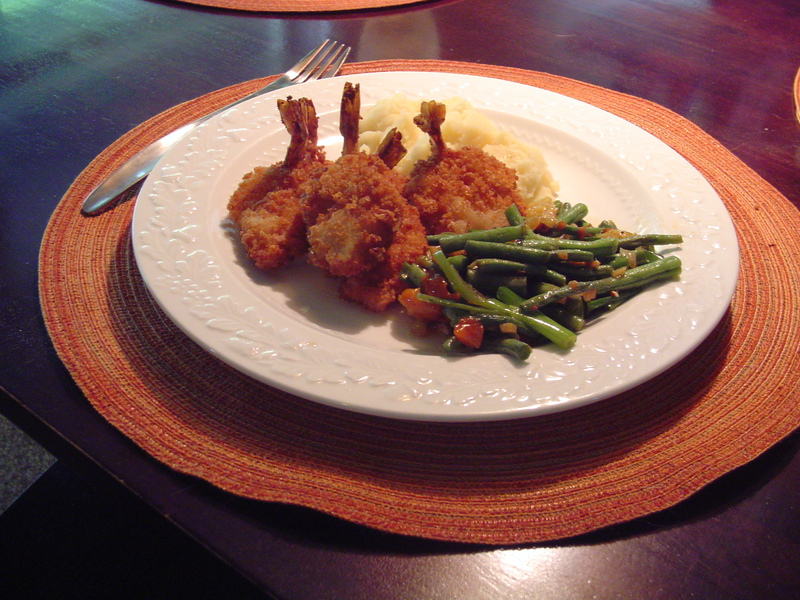 I do make a recipe for shrimp with Panko breadcrumbs that I bake in the oven but it was just too hot yesterday. I’ll give you that recipe when I find it Care. It is in the Martha Stewart FOOD Cookbook. and in some cases the beans will separate us!